Last night my friend Luke Kilpatrick came over and we compared the Droid to the Palm Pre and iPhone. He’s a bit biased toward the Palm, and ran the first Palm Pre Dev Camp but he’s also a mobile freak and has an iPhone and an HTC Hero, which runs an older version of the Android OS. Plus we get together with other people at the Ritz and compare phones regularly and I know he is fair and knows his stuff. Why did I buy the Droid when I’m a happy iPhone? Because for the past two days Dave Winer has been praising the Droid and because I want to stay up to date on what’s going on on the Android OS. It’s one thing to try a phone for a couple of minutes, it’s a whole nother thing to force yourself to use it. Anyway, I could keep going. I’ll keep it at least a week and push myself to use it. The voice quality is so much better that I might just use it as my phone and keep the iPhone for other things. I’m fortunate that I can afford to do that, but if I were forced into picking one, today, I’d pick the iPhone without hesitating and I’d recommend the same to everyone. I told Dave Winer that it looks a lot like Windows 3.1. The Mac back then was way better, but we all know that Apple ended up in 1995 with a small market share compared to Windows 95. The thing is, the Droid is Windows 3.1. It is showing the momentum is shifting but now Google has to ship their metaphorical equivalent of Windows 95. It isn’t this phone. 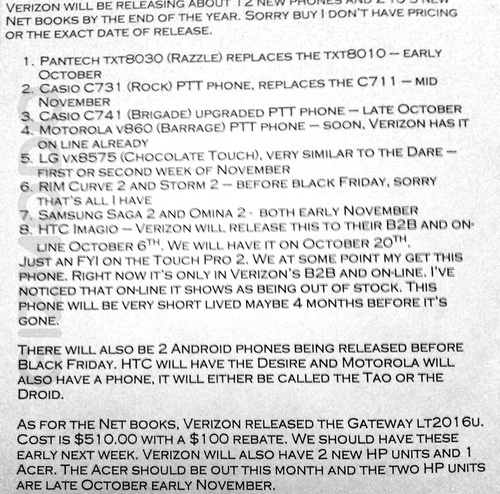 Gizmodo received a note from a reliable source hinting that Motorola Tao / Droid / Sholes will be available before Black Friday. No word about the Palm Pre.